Rated R for language and some drug use. In 1981, Yossi Ghinsberg, all of 21 years old, traveled to South America with dreams of adventure. He ended up in La Paz, Bolivia where he befriended Marcus Stamm, a Swiss teacher, and Kevin Gale, an American photographer. Together, they set out on an expedition into the uncharted Amazon led by the mysterious Karl Ruprechter, an Austrian man who claimed to have knowledge of hidden gold. After traveling for several days with low supplies and frayed nerves, the four men separated—Karl and Marcus would walk while Yossi and Kevin set out on the river in a raft. But as the raft neared a waterfall, Yossi and Kevin lost control and got separated from each other. Yossi spent three weeks stranded in the jungle with no supplies and little food before being rescued by a search mission just before they were about to abandon hope. Yossi’s remarkable tale of bravery and fortitude feels ready made for a film adaptation, one that delves into the psychological horrors he faced alone in the jungle, uncertain if he’d ever make it out alive. Director Greg McLean (best known for his debut horror film “Wolf Creek”) delivers on this promise with the gritty, yet ultimately overwrought “Jungle.” Starring the always-game Daniel Radcliffe as Yossi, “Jungle” succeeds in communicating the young Israeli kid’s horrible situation, as well as the camaraderie between him and his new friends, but falls short when trying to visually explicate his mental state. For most of the film, McLean coasts on the real-life details of Yossi’s story to great effect. He and Radcliffe wonderfully capture Yossi’s open, yet reckless mindset as he lands in La Paz and meets Marcus (played by Joel Jackson) and Kevin (Alex Russell, who conveys just the right amount of American arrogance). McLean strikes the right tone during Yossi and the crew’s first few days out in the jungle, hovering somewhere between dangerous and exciting. He’s also perceptive about how the unstable environment creates a hierarchy amongst those who dare enter it—Yossi and Kevin adapt right away, but Marcus immediately feels out of place and his blistered, cut-open feet are unable to keep up with his buddies. Marcus begins to lose it while Yossi and Kevin resent him for dragging them down. Ironically, “Jungle” starts to lose its way when Yossi loses his. As soon as McLean has only Radcliffe and the jungle as his two main characters, he starts over-relying on cheap effects and hoary psychological clichés to express Yossi’s fraught state of mind. Yossi certainly suffered from hallucinations and near-fatal exhaustion during his harrowing journey, but “Jungle” illustrates this with faux-delirious imagery and wholly unnecessary flashbacks that exist only to break up the monotony of the action. There seems to be great trepidation on McLean’s part to simply allow Radcliffe to communicate the character’s own internalized emotions. Instead, he employs visual gimmickry as cheap support. 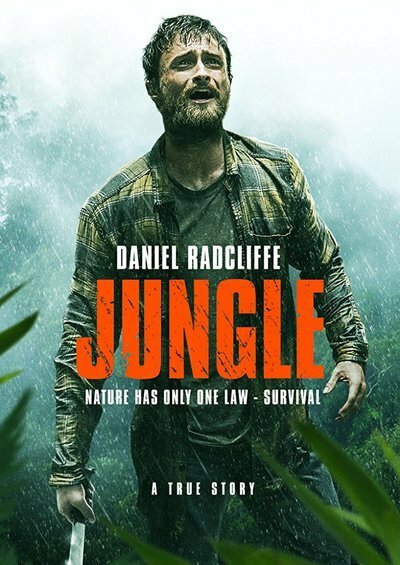 It’s a shame because Radcliffe carries “Jungle” on his shoulders, when McLean or Justin Monjo’s script lets him. He admirably throws himself into this role and plays Yossi as a kid who got into an adventure that was way over his head. He excels at channeling Yossi’s frustration with his own rudimentary exploration skills, like when he realizes he’s spent the day walking in a circle or when he can’t get the rescue plane overhead to see his location. He stumbles occasionally when he has to monologue his own fears (his shaky Israeli accent is mostly to blame), but it’s primarily a physical role, and luckily he’s up to the task. There’s still great charge in watching the former Harry Potter as an emaciated wreck, crawling through the brush whilst screaming for help. Despite its many obvious flaws—shaky dialogue, unsubtle sound design, a strong tendency to visually explicate simple ideas—Yossi’s story has enough weight on its own to render “Jungle” a moderately compelling survival flick. The film is on solid ground when it relies solely on the unique dangers of the Amazon, like in the film’s best scene when Yossi finds a parasite lodged in his forehead and must use tweezers to extract it. Moreover, Yossi’s straightforward plight makes him a strong protagonist and keeps the audience invested in his struggle to stay alive. Sometimes a compelling reality is all you need to make a good fiction.